Vijay's ‘Puli’ joins 5 million club! Home » Chimbu Devan | Hansika Motwani | Puli | Shruthi Haasan | Vijay | YouTube » Vijay's ‘Puli’ joins 5 million club! 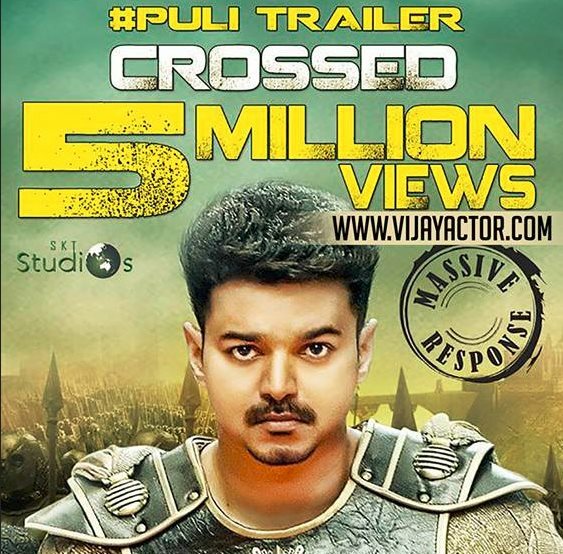 The trailer of Ilayathalapathy Vijay's Puli has crossed more than five million views on You Tube. Till now, regional film trailers like 'I', Lingaa and Baahubali have registered more than five million views and Puli is the recent one to join the elite club. Directed by Chimbu Devan, Puli has ensemble of star cast including Sridevi, Sudeep, Shruti Haasan, Hansika,Prabhu, Nandita Swetha, Thambi Ramaiah, Imman Annachi, Vidyullekha and many. Billed as a fantasy action thriller, Puli is scheduled to release on October 1 and it is being jointly produced by SKT Studios and Vijay's manager, PT Selvakumar.